Hog Roast Enniskillen are known for our dedication to the time-honoured tradition of cooking meats whole with our slow and thorough technique. The result? A product that is moist, succulent, incredibly tender and irresistibly flavoursome. We guarantee that just one taste of our Hog Roast Enniskillen food will make you question why you ever settled for anything less than our mouth-watering standards. 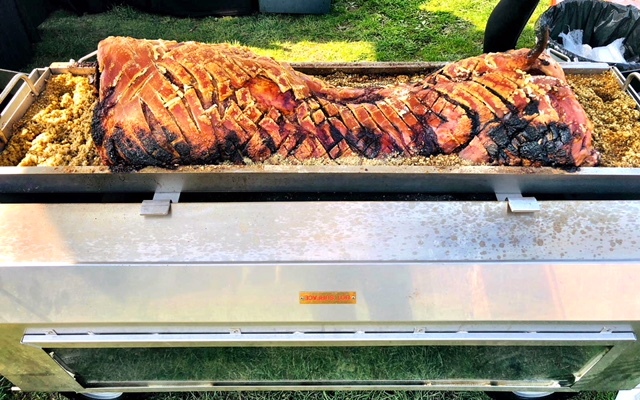 As one of the UK’s leading caterers in the hog roasting world, we also specialise in the hire and sale of cutting-edge designs in hog roasting equipment. Our team of engineers who operate from our Hog Roast Enniskillen factory in the north west of England, design and build each and every one of our machines to our exact specifications. This means that we have designed the most efficient, durable and reliable machines in the hog roasting business. What’s more, is we love to share our passion for cooking with the public which is why we rent out and sell our machines to members of the public and even our fellow caterers! Today we were out and about on our way to an event. Along the way, we made a stop to pick up our Titan machine from one of our recent hire customers, Kevin. Kevin had come to us looking for a unique way to cook his Sunday roast for his family. After hearing complaints from his kids about his poor cooking skills, Kevin wanted to push the boat out and stop them from moaning by cooking up a Hog Roast Enniskillen feast. We had provided Kevin with all the ingredients and knowledge he would require to use the Titan and reminded him we were only ever a phone call away should he have any trouble. Upon collecting the machine, we were pleased to hear how impressed Kevin’s family had been with his cooking. Not only had they eaten every last morsel, but they also requested he do the same the following weekend! 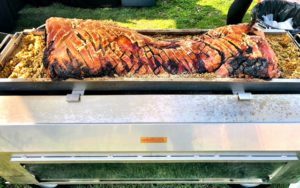 Slow Roasted Pork – Paired With Rum – Perfect Combination from Hog Roast Ballymoney!